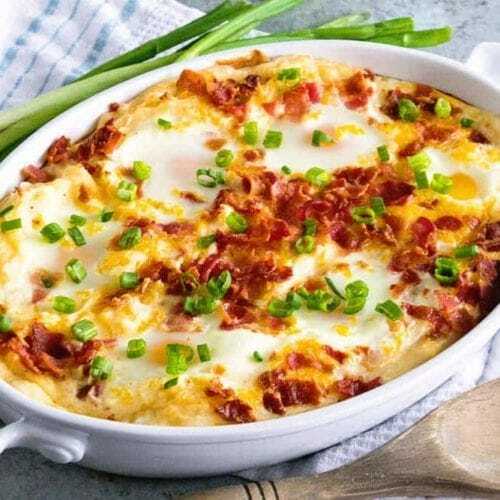 Cheesy Mashed Potato Egg Casserole ~ Perfect Breakfast or Brunch Casserole Loaded with Mashed Potatoes, Eggs, Cheese and Bacon! This Hearty Breakfast Recipe is Perfect for Entertaining! You are going to think I’m a slightly odd duck when I tell you this, but breakfast…breakfast gets me excited you guys! It’s so backwards because I really hate getting up in the morning and I don’t make a big breakfast very often but I love it all the same. I especially love it when I serve it for dinner! Luckily for me my girls and hubs love it too. The girls are always requesting eggs, pancakes, waffles etc. I think I might love serving it for dinner because I feel like I’m daring and on the edge. Yes, in my life that’s about as daring as I get! Also, another daring point in my life was using mashed potatoes in a breakfast casserole. I usually opt of hash browns like 99% of other people but I went out on a limb and decided that mashed potatoes were going to happen. You guys, it was epic! We’ve made this multiple times already and that’s saying a lot! We’ve also mixed things up and substituted the Simply Potatoes® Mashed Potatoes our for their Simply Potatoes® Garlic Mashed Potatoes. Amazing! If you are a garlic lover like me then you need to try this option too! Plus, Easter is right around the corner! Can you believe it? If you are looking to keep your holiday meal simple this is your ticket! This recipe comes together in minutes so you can spend time with your guests instead of slaving over the meal in the kitchen. Sounds like a win right? I’m practicing #SimplyHolidays and making it real and simple! One thing that is always stocked in my fridge is Simply Potatoes. Whether it’s their fabulous mashed potatoes, hash browns or diced potatoes they make my meal times way simpler. Plus, I love that they are fresh and never frozen potatoes and made with real ingredients! I can either throw them in my favorite recipe or serve them up as a side dish. Either way it’s a win for this Mom! Make sure to check out their product page! 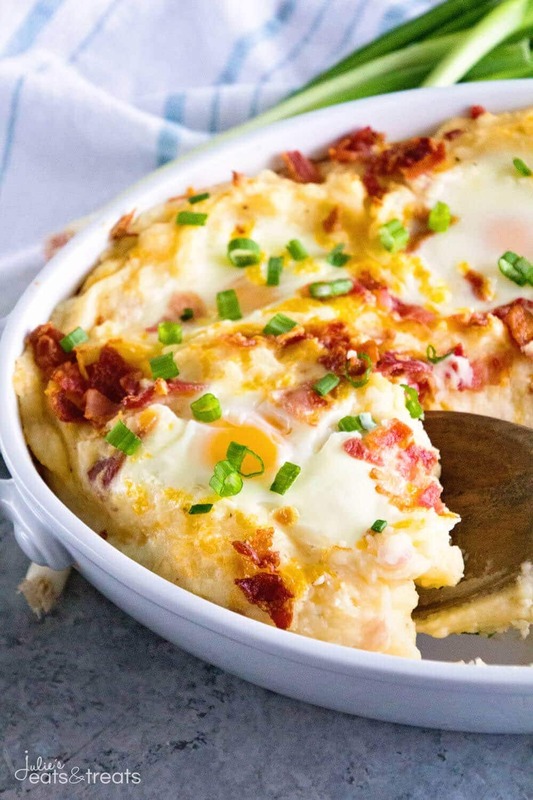 For this delicious Cheesy Mashed Potato Egg Casserole I dressed up our Simply Potatoes Traditional Mashed Potatoes! I love that it’s the perfect quick and easy breakfast or brunch recipe for your family or when you have guests plus it would be great for breakfast for dinner because it’s so hearty! Connect with Simply Potatoes for more great dinner ideas! If you love this recipe, be sure to try The BEST Tater Tot Breakfast Casserole! 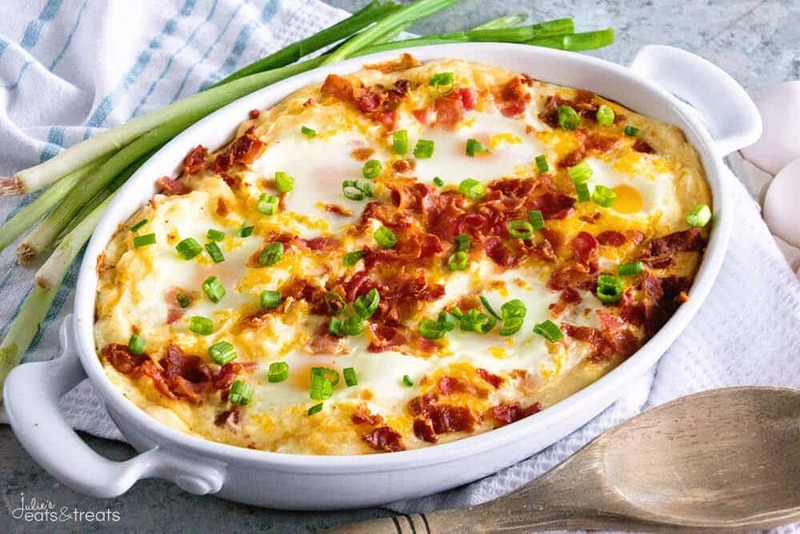 Perfect Breakfast or Brunch Casserole Loaded with Mashed Potatoes, Eggs, Cheese and Bacon! This Hearty Breakfast Recipe is Perfect for Entertaining! In a large mixing bowl combine potatoes, garlic, pepper, salt, 1 c. cheese and half of the crumbled bacon. Mix until combined. Spray 2 quart casserole dish with non-stick spray. Spread mashed potato mixture in bottom of pan. Next, make 6 wells in the mashed potatoes for the eggs. Crack eggs into the wells. Sprinkle remaining bacon and cheese on top of potatoes. Baked 15-20 minutes or until the whites of eggs are just set but yolks are still slightly runny. If you prefer your eggs more done bake longer. Would be perfect, you could go directly to the table with this. My first dish would be mac and cheese. Breakfast gets me excited, too. Some days it’s all that gets me out of bed :). 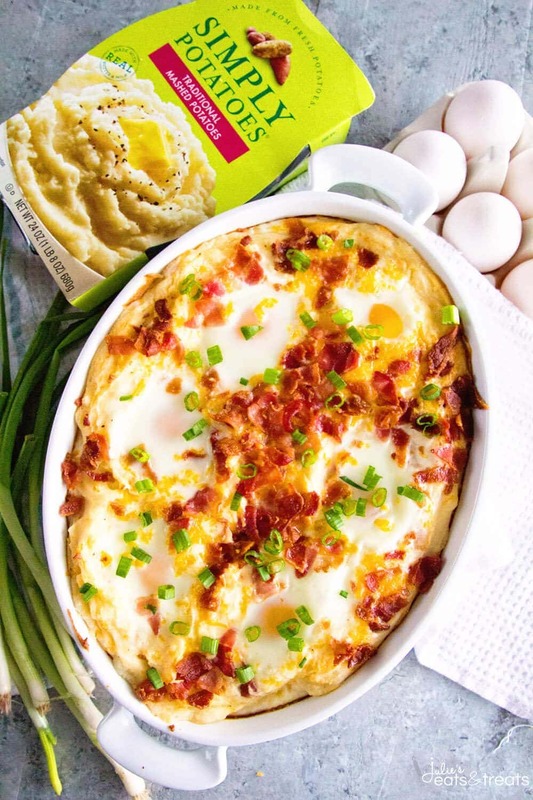 This casserole looks fantastic–perfect for Easter brunch! I would bake a broccoli casserole. I’d make a cheesy veggie strata! Yum, yum! This would be perfect for egg casserole! I would make loaded mashed potatoes with broccoli, bacon and cheese. This looks awesome…bacon, potato, cheese….what could go wrong! Love this!! What a great idea to use mashed potatoes! Don’t think I could love this recipe more… perfection! I will make this dish, I especially like the eggs baked on top! There’s no way I’d rather start my day than with mashed potatoes and a hefty dose of melty cheese! Seriously, this is genius. Cannot wait to try! Wow….can u say “sodium”? Yikes….sounds great, but I’d have to do something about the salt!